I somewhat hit an impasse while I was preparing the new paperwork for the Welztalbahn: I did not have a table of Richteinheiten. 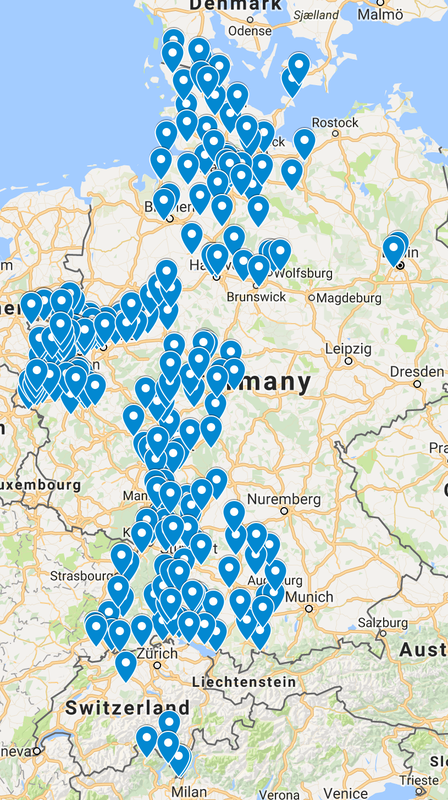 Think of a Richteinheit like a postal codes for freight destinations, identifying the closest major yard or origination of the last local freight train handling a given freight car. On the one hand I wanted to make progress on the paperwork. On the other hand, it didn't feel right to go through the trouble making paperwork and then having to update it later with the "correct" codes when I got my hands on the respective table. While browsing through forums in early February, I read about the Verkehrsarchiv in Nuremberg which is now part of the library at the DB Museum in Nuremberg. On a whim I sent an email to the named contact hoping for a redirect to a location that might have Gueterzugbildungsvorschriften (GZV) from the early 1970's. These rulebooks describe blocking for each scheduled freight train, as well as any special considerations as needed. The book is updated every 6 months along with the updated "winter schedule" and "summer schedule". 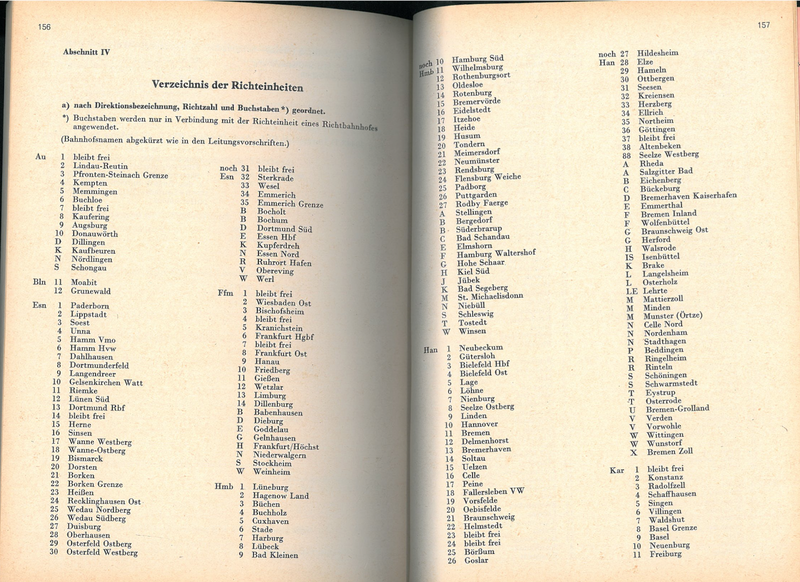 In one of the appendixes of each GZV is the Richteinheiten table. Imagine my surprise when I got a super-friendly email back, "yep, I found what you are looking for. We have the GZV from 1968 and 1972. Let me know if you'd like a copy of the table." A couple days later I had scans of the Summer 1972 Richteinheiten table in my Inbox. The main focus of this exercise is to add flair to the paperwork on the Welztalbahn. I'm building a table of industries, companies, and locations that my on-layout industries exchange freight with. Thus I wanted a quick and easy way to figure out which Richteinheit code would likely appear on the paperwork for each car. I started to transfer the information from the scans into a Google Maps custom map. I'm about 50% done with this, it will likely take me another week or so to link the remaining codes with stations and yards. This map will include all Richteinheiten of Deutsche Bundesbahn from GZV Summer 1972. It does NOT include any information about routing freight within the GDR at that time. I'm using a modern day Google Map as basis which leads to some inaccuracies due to some freight stations and yards being torn down since the 1970's (e.g. Han 10 / Hannover Hgbf) or substantially reconfigured. In addition, some areas, particularly in the Ruhrgebiet, have so many former and active freight yards and stations in close proximity that it is hard to pinpoint exactly which yard is which without someone familiar with the localities involved. I welcome comments and corrections. Richteinheiten are organized by Bundesbahndirektion (DB regional office). As of March 22nd, I have completed adding yards and freight stations for all regional offices: Augsburg, Berlin, Essen, Frankfurt, Hamburg, Hannover, Karlsruhe, Cologne, Kassel, Mainz, München, Münster, Nürnberg, Saarbrücken, Stuttgart, and Wuppertal. I embedded the live map below. Click the rectangle in the top right corner to open it in a new window.